I hope everyone enjoyed the weekend! We spent some time with friends and went to dinner with them. Poor LO has a runny nose and since she can't breath through her nose, she's has to breathe through her mouth instead and keeps drooling through all her shirts. Is it bad that I find that funny? Her spirits have been great and she hasn't been grumpy at all. I've got a popular Sinful Colors polish today called Cinderella, and true to its name, it's a delicate light blue shade with a strong pink shimmer. Unfortunately, the formula is terrible. It was very streaky and sheer during application and took forever to dry in between coats. I used three coats for this mani with no topcoat. I would recommend using a quick drying topcoat on this if you don't want tons of dents. I took some extra pics because I wanted to try and capture the pretty pink shimmer. If you can get past the nightmarish application of this polish, the polish truly is the stuff from fairy tales. After taking these pics, I promptly dented most of the fingers by doing nothing - the polish still hadn't dried despite giving it plenty of time to dry. 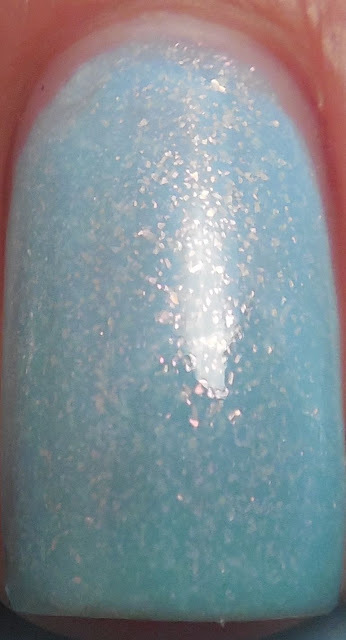 Sadly, this is one of the few fails that I've encountered from Sinful Colors and it's going into my swap pile.